Delilah Saunders is pictured in her room in Toronto General Hospital, Tuesday, December 19, 2017. An Inuk activist from Labrador is back in hospital with pancreatitis after doctors told her she would not need a liver transplant amid questions about her eligibility under an Ontario program's alcohol-use policy. ST. JOHN'S, N.L. 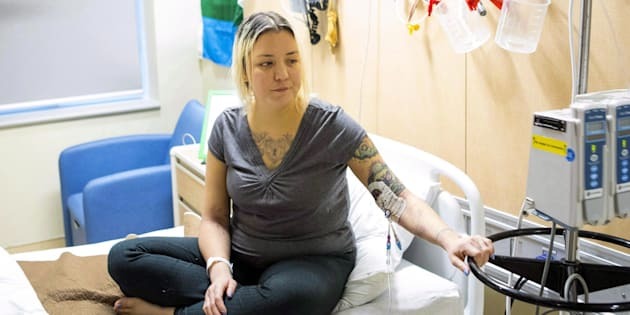 — An Inuk activist from Labrador is back in hospital with pancreatitis after doctors told her she would not need a liver transplant amid questions about her eligibility under an Ontario transplant program's alcohol-use policy. Delilah Saunders posted to a video to Facebook on Thursday saying she'll be staying at the Health Sciences Centre in St. John's, N.L., for a few days until her pancreas is stable. Saunders says in the video that doctors are monitoring her condition and managing her pain, which she described as "excruciating." The 25-year-old activist for Aboriginal women was released from a Toronto hospital last weekend after doctors told she would not need a transplant in the immediate future. Saunders, who was treated for acute liver failure, has said doctors initially led her to believe she was ineligible for a transplant because she had not abstained from alcohol for the prior six months. Her case spurred a national discussion about an Ontario transplant program's six-month abstinence policy, which transplant doctors have said is supported by research suggesting some alcoholics return to drinking after the procedure.